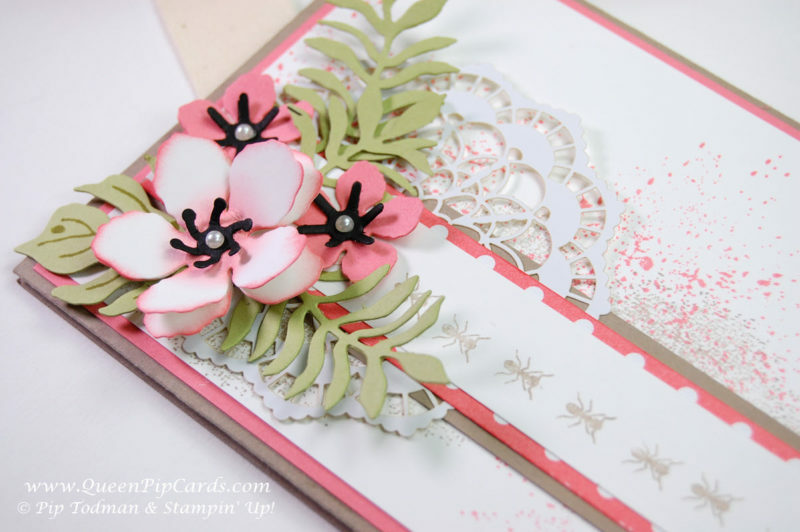 Welcome to our Wildlife by Stampin Creative Blog Hop team! 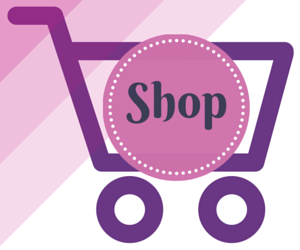 Don’t you just love our new banner logo?!? Very posh I think! Not at all wild looking! However we did decide to use Wildlife as our theme this month. There are so many fabulous sets featuring creatures great and small we decided to showcase them in this month’s hop. Welcome if you’re starting here or have joined me from the lovely Emma. Today I’m featuring Beetles and Bugs! 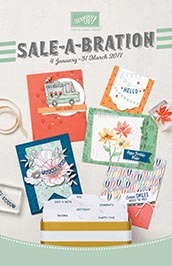 You and your kids will love creating all kinds of beetles and bugs to use in your cards, scrapbooking or school projects. These stamps are made from photopolymer, so you can see where you are stamping, making it easy to add the colourful wings or back casings, but for this card I went for subtle – kind of! I had in my head this card with bugs or something hidden by the flowers from the Botanical Builders framelit dies. If I could put the two together it should look good, but then I decided to go with a line of ants. I was thinking they could carry a leaf, but they didn’t look quite right. Light-bulb moment I realised that a slider card was the perfect answer and so this card design was born. 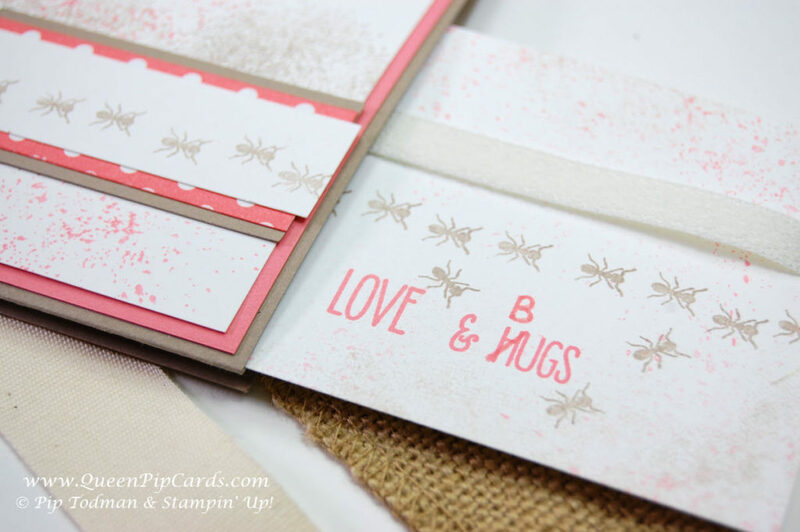 When you pull the slider ribbon the hidden inside panel slides out and you get a line of ants coming out of the card wishing you some Love & Bugs (adapted from the Sunshine Wishes stamps). 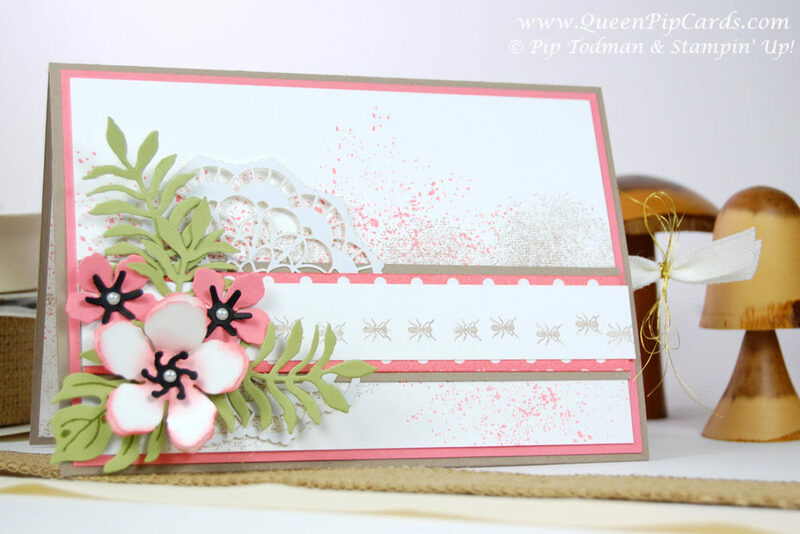 The background is from Touches of Texture, which is fast becoming my go to background stamp set. The colours are Tip, Top, Taupe and Flirty Flamingo, which is a colour combination I came up with a while ago but still really like and it makes a change from the usual Crumb Cake for anything “grunge”! So despite the fact this card has bugs on it, it’s feminine because of the colours and flower additions. Having watched Winterwatch this past week, I think it would be suitable for their resident bug lady! For the finishing touches, I added a cover inside to hide the mechanism of the slider, plus a great sentiment from the new Balloon Adventures stamp set. This stamp is a really good size, either to use inside or as a focal point on a card front, and of course I had to add a few more ants! I hope you’ve enjoyed my walk on the wild side! 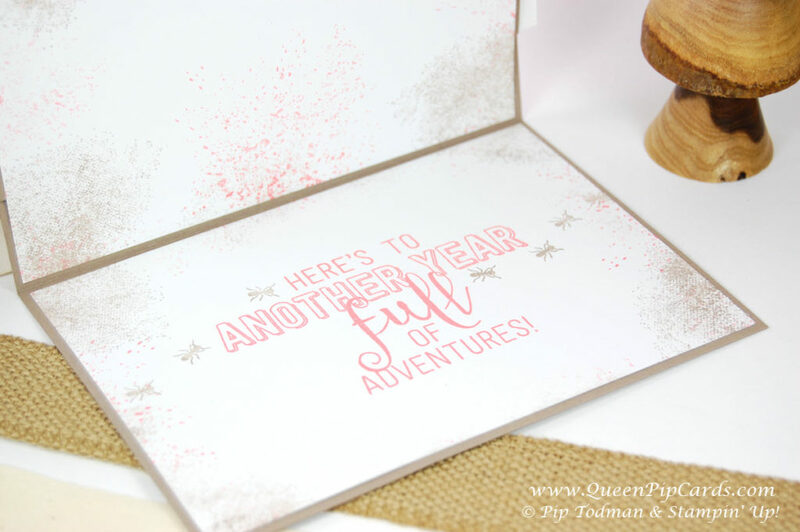 Let’s see what Wildlife by Stampin Creative Eimear has come up with – I know she had to put her thinking cap on as apparently she doesn’t do wildlife much in her stamping! I can’t wait to see what she made! Hop over now by clicking the Next image, or use the list below. 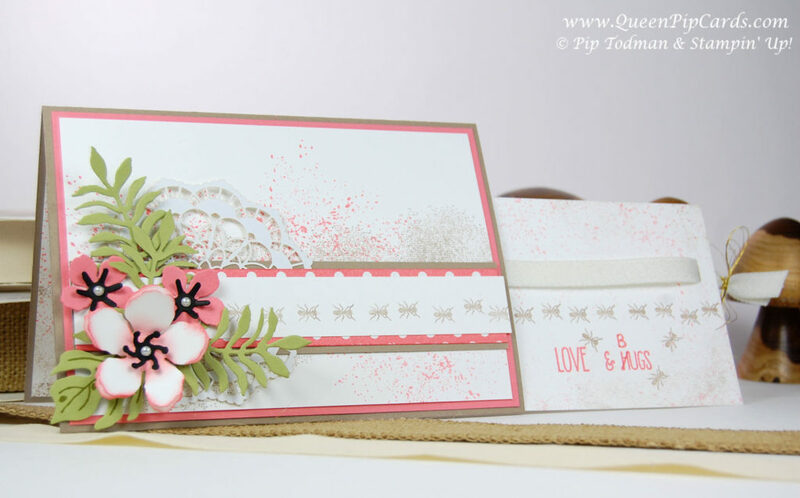 Don’t forget you can grab all of the supplies to make this card using the product line up below the list. 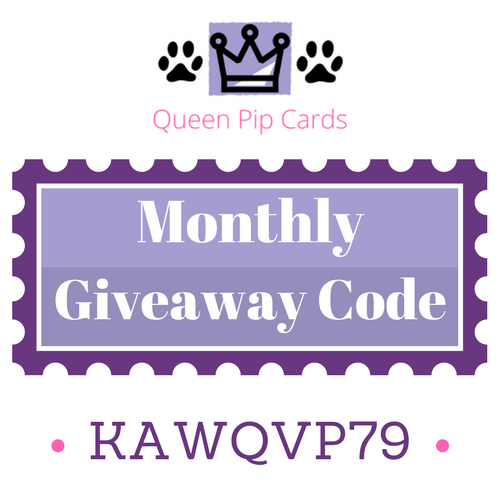 – Fill in the Subscribe form below to keep up to date with all the news and get exclusive projects from Queen Pip Cards.